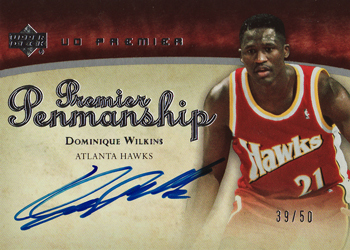 On Saturday, I posted an image of a 2007-08 Upper Deck Premier Penmanship card of Dennis Rodman, that I had received that morning in the mail. Today, I thought I would showcase the four remaining cards from the same set that accompanied it. Namely those of Jason Kidd, Paul Pierce, Walt Frazier and Dominique Wilkins. 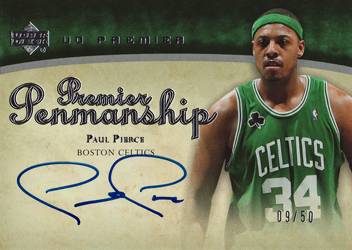 The Paul Pierce version is a particularly pleasing addition, in that not only does does it fit in with my focus on autograph cards of players who were drafted in the 90s, have been an NBA All-Star and won an NBA Championship, but it is also the first card featuring his autographed that I have in my collection. It's arrival, with the Celtics forward currently pushing hard for his third appearance in the NBA finals in five years, is also well timed. 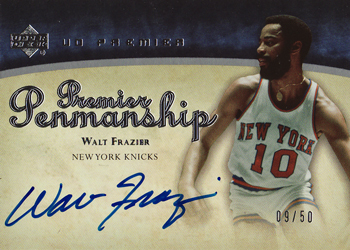 The 2007-08 Upper Deck Premier release featured some great looking autograph cards (I particularly liked the 'Consummate Masters' set) and I plan to add a number of others stars & legends from this set to my collection ver there coming months. If anyone has any for sale or trade, please do hit me up via the 'Contact Me' page, which can be found on the right hand side of this blog.